Atmstrong, from the 1969 Technical Debriefing - "The one thing that gave us more trouble than we expected was the TV cable; I kept getting my feet tangled up in it. It's a white cable and was easily observable for a while. But it soon picked up the black dust which blended it in with the terrain, and it seemed that I was forever getting my foot caught in it." Aldrin: The blue color of my boots has completely disappeared now into this...Still don't know exactly what color to describe this other than (a) grayish-cocoa color. It seems to be covering most of the lighter part of the boot (garbled) color that (garbled) very fine particles. (Garbled). “Gee, it’s a dirty spacecraft in here,” Bean observed. 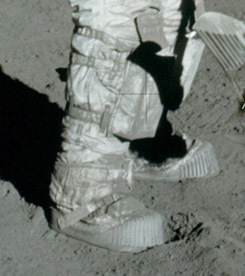 The cohesive properties of lunar dust in a vacuum, augmented by its electrostatic properties, made it adhere to the suits, sample return containers and other items that had been brought inside after the moonwalks. The adherence of the dust diminished in the presence of the cabin atmosphere, and a lot of it had settled on the floor. Now that they were weightless, some of the dust began to float and disperse. Since there was enough particulates to affect vision and make breathing difficult and potentially hazardous, they remained fully suited. In the 1960s and 1970s, the Apollo Moon Program struggled with a minuscule, yet formidable enemy: sticky lunar dust. Four decades later, a new study reveals that forces compelling lunar dust to cling to surfaces -- ruining scientific experiments and endangering astronauts' health -- change during the lunar day with the elevation of the Sun. The study analyzes the interactions on the Moon among electrostatic adhesive forces, the angle of incidence of the Sun's rays, and lunar gravity. It concludes that the stickiness of lunar dust on a vertical surface changes as the Sun moves higher in the sky, eventually allowing the very weak lunar gravity to pull the dust off. "Before you can manage the dust, you have to understand what makes it sticky," says Brian O’Brien, the sole author of the paper. His analysis is the first to measure the strength of lunar dust's adhesive forces, how they change during the lunar day -- which lasts 710 hours -- and differ on vertical and horizontal surfaces. O'Brien used data from the matchbox-sized Dust Detector Experiments deployed on the Moon's surface in 1969 during the Apollo 11 and Apollo 12 missions. Lunar dust has long been described as the No. 1 environmental hazard on the Moon. It causes miscellaneous havoc: from destroying scientific equipment deployed on the lunar surface -- dusty surfaces absorb more sunlight and make devices overheat -- to creating blinding dust clouds that interfere with lunar landings. It also may be a health hazard to space travelers, since dust clinging to space suits detaches when astronauts reenter their lunar module. It then floats free in zero gravity, ready to be inhaled, during the 3-day journey back to Earth. Lunar dust particles are minuscule, with an average size of 70 micrometers, the thickness of a human hair. The particles get positively charged by photoelectric effects caused by powerful solar ultraviolet radiation and X-rays -- the thin lunar atmosphere does not attenuate solar radiation -- generating strong electrostatic adhesive forces which compel the specks of dust to cling to surfaces of scientific instruments and space suits. In his new study, O'Brien analyzed the behavior of dust on horizontal and vertical solar cells in one of the Apollo dust-detecting experiments. On the first morning of the experiment, the lunar module -- 130 meters (426 feet) away from the dust detector -- took off from the Moon’s surface. The blast of exhaust gases completely cleansed a dusty horizontal solar cell, because it was illuminated only by weak early-morning light and thus the adhesive force of dust was faint. But only half the dust covering the vertical cell was removed by the blast, because its surface faced east -- into more intense sunlight -- and thus the sticky forces were stronger. O'Brien found that later, as the Sun rose and the angle of incidence of the Sun's rays on the dusty vertical surface facing east decreased, the electrostatic forces on the vertical cell weakened. The tipping point was reached when the Sun was at an angle of about 45 degrees: then the pull of lunar gravity counteracted the adhesive forces and made the dust start falling off. All dust had fallen by lunar night. "These are the first measurements of the collapse of the cohesive forces that make lunar dust so sticky" O’Brien says. In 1965, NASA selected O'Brien, an Australian physicist who was then a professor of Space Science at Rice University in Houston, Texas, to be the principal investigator in one of seven lunar experiments designed for the Apollo Program. O'Brien started researching lunar dust in 1966 because he feared for an instrument he developed that was to be left behind on the Moon by the Apollo 14 mission. He worried that the device, which measured the flux of charged particles, would end up covered in dust and ruined. Lunar dust is "a bloody nuisance," he says. In 1970, O'Brien published a paper which he says proved that rocket exhaust gases from the Apollo 11 Lunar Module had lofted dust and debris which then coated the surface of a lunar seismometer -- the first instrument deployed by human hands on a celestial body. The seismometer then overheated by 50 degrees and failed after three weeks' operation. An official 1969 NASA report was incorrect in stating that no contamination had occurred, O'Brien says. But it wasn’t until late 2006, when O'Brien learned from NASA’s website that the space agency had misplaced data tapes from its dust-detecting experiments, that he decided to revisit his own set of 173 tapes. NASA had sent him these tapes one by one in 1969 and 1970, when he was working at the Department of Physics at University of Sydney. He took them with him when, in 1971, he moved to Perth for a new job. O'Brien's tapes are now the only known record of data from those vintage experiments. Working alone and self-funded, the 75-year-old scientist dedicated two years to analyzing paper charts printed out in 1969 and 1970 from the magnetic tapes, which contain 6 million measurements, most of them yet to be analyzed. For future Moon and Mars missions, O'Brien offers a practical solution to the dust hazard: Use a wide Sun-proof shed, to block the rays that enhance dust's adhesive forces. "Getting closer to understanding the physics of the lunar dust problems means moving one giant step towards management of the hazards," O’Brien says. The Apollo astronauts knew that moon dust was troublesome stuff. Now that dust could limit our ability to find cracks in Einstein's general theory of relativity. Many of our best tests of relativity come from lunar ranging experiments. Several times a month, teams of astronomers from three observatories blast the moon with pulses of light from a powerful laser and wait for the reflections from a network of mirrors placed on the lunar surface by the Apollo 11, 14 and 15 missions, as well as two Soviet Lunokhod landers. By timing the light's round trip, they can pinpoint the distance to the moon with an accuracy of around a millimetre – a measurement so precise that it has the potential to reveal problems with general relativity. But now Tom Murphy from the University of California, San Diego, who leads one of the teams at the Apache Point Observatory in Sunspot, New Mexico, thinks the mirrors have become coated in moon dust. "The lunar reflectors are not as good as they used to be by a factor of 10," he says. The fainter light is a problem for lunar ranging experiments. Out of every 100 million billion (1017) photons Murphy's team fires at the moon, only a handful make it back to Earth. Most of are absorbed by Earth's atmosphere on the way to the moon and back, or miss the mirrors altogether. Murphy's findings also highlight problems that astronomers might face if they ever build a telescope on the moon.